Investing in smart lights, like Philips line of Hue smart bulbs and fixtures, means no more fumbling for your house keys in the dark or wasting money on lighting empty rooms. You can turn on and off all of the lights from anywhere you have an internet connection, be that tucked in at bed at night or when you pull into the driveway. But once you’ve invested in smart lights, there’s so much more you can do beyond merely replacing the physical light switch with a virtual one. Here are our twelve favorite things you can do with your Philips Hue. 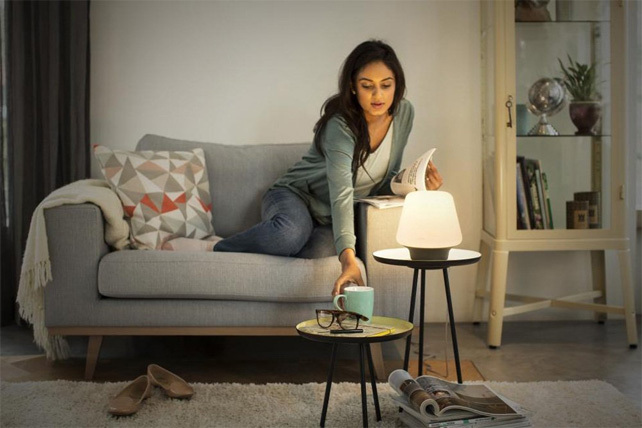 As an alternative to your regular alarm, these smart bulbs can be scheduled to wake you up by mimicking the sunrise effect and fading in gradually. So instead of a jolting noise—which can increase higher blood pressure, heart rate and stress level, you’re waking up naturally as if you’re reacting to the sunlight streaming in from your window in the morning. 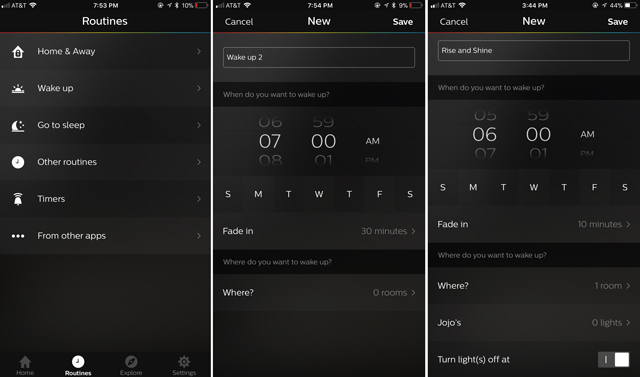 To set it up, simply open the Hue app on your phone, go to Routines and select Wake up. Then start a new alarm by choosing the time, day/s of the week, fade-in time, specific room or bulb, and turn off time. Set timers so that a specific light or all the lights in a room turn on, switch to a specific color or even blink when a timer is done. It’s useful for situations like when you’re cooking something in the kitchen, but you have to do something in another room or when the baby is asleep, and you want to avoid using a regular audio alarm to let you know when the laundry is done. Setting these up on the Hue app is just as easy as scheduling a wake-up alarm. You just need to go to Routines and select Timers instead. 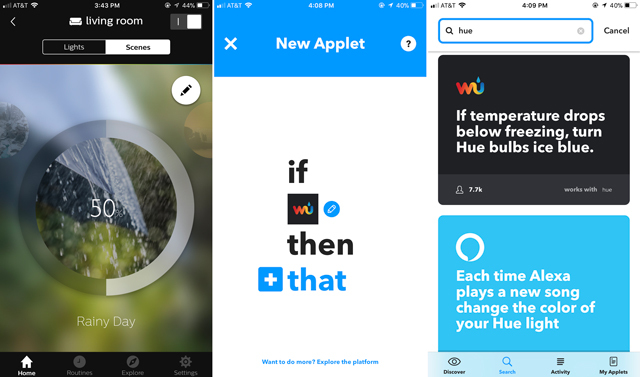 The amazing IFTTT app connects your apps to a device like your Philips Hue lights and bulbs. So, you could set up a rule to turn a light blue any time you get a call from a family member – great for new parents that don’t want to wake the baby. Or, you could set up more complicated tasks, like have the lights turn green when your smart security system sense that someone’s walking to your front door, turn red if smoke or high levels of carbon monoxide is detected through Nest Protect($120 on Amazon), or even blink when the International Space Station is passing over your house. Did you know that you could also schedule the lights to turn on or switch to a specific color to set the vibe for your daily routines? You can do yoga in calming blush pink, work out in invigorating red and read in a warm yellow-orange light. Using the lights’ dimming capabilities, you can also set the light to a warmer, less bright yellow-orange for relaxing and turn it down all the way to 25% to wind down for bedtime. You can set all these up as you would a wake-up alarm in the Routines tab in the Hue app. Even better than matching your daily routines is setting the lights to match your mood, so whether you’re happy or sad, fun and flirty or serious and hard at work, your home can feel like it complements what you’re feeling. Going beyond that, you can also use them to set the mood in different rooms for activities like a relaxing bubble bath, date night, movie hosting a dinner party or family game night. Whether it’s a bright sunny day with clear blue skies or fiery with the purple and orange hues of the sunset, Philips Hue lights can match the time of the day or the type of weather you are having. With the Hue app’s Picture Scenes feature, you can choose a photo, and the apps will try to match the colors. It’s kind of like having your very own Hogwarts Great Hall ceiling. 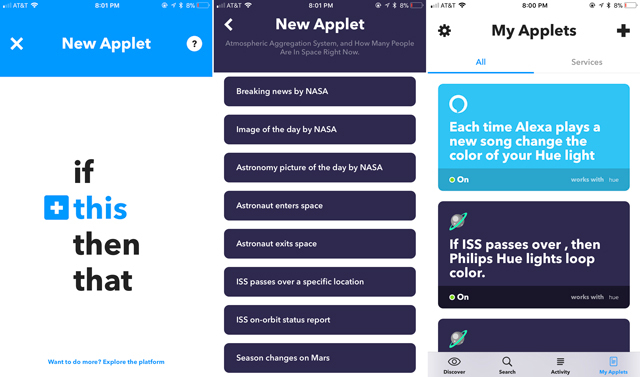 Plus, thanks to the IFTTT app and weather-related services like Weather Underground, you can have your lights automatically change color or even mirror the weather condition in your area. There are several apps available that lets you sync your lights to your music so that they change colors and even blink and flicker to the beat. Our favorite is iLightShow (free for iOS and Android) which offers a range of options to customize the experience without having to pay extra. Go with a preset – Auto, Chill or Party – or create a custom experience, where you control Brightness, Saturation, Energy and Color Changes. With third-party apps and gaming peripherals with reactive lighting, you can integrate your Philips Hue lights so that it floods your gaming room or living room with reactive lights. 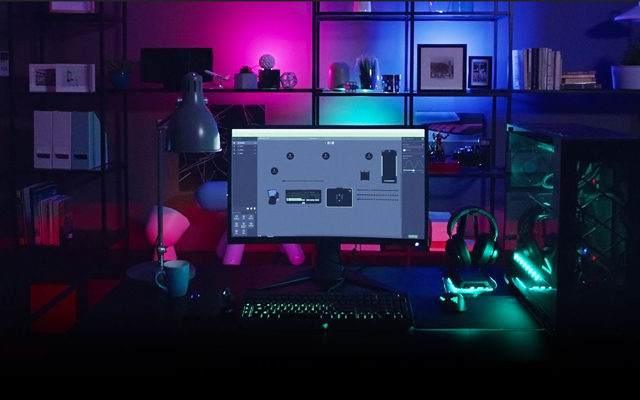 After installing hueDynamic (Windows and Xbox One) and attaching a compatible gaming peripheral, like Razer Chroma, you can use the Hue app to have your lights will reflect the action in the game. Simply go to Explore then Hue entertainment to synchronize the gameplay with your lights. While Philips has promised the same easy integration for movies and TVs shows, the Hue app isn’t there quite yet. For now, use your smartphone camera with apps like Hue Matcher (free for Android) and Hue TV ($2.99 for iOS) to capture what’s on your TV and reflect those colors in your Hue lights to create an immersive viewing experience. Or, if you’re watching videos on your computer, try ScreenBloom (available for Windows and Mac). You need not worry about stubbed toes or head bumps when you’re going to the bathroom in the middle of the night anymore. With an inexpensive Hue Motion Sensor ($40 on Amazon), which you can station in hallways, at the bottom of your nightstand or anywhere that makes sense, you can set a Hue light to light your way when it receives the cue from the motion sensor. 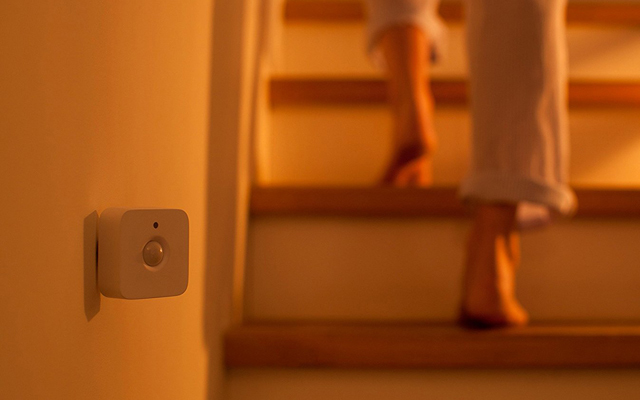 You can also use the Motion Sensor to save energy by installing it in rooms you only spend a few minutes at a time in, like the laundry room and the garage, and program the lights to automatically turn off when the Motion Sensor doesn’t detect movement for a predetermined amount of time. Or install it in the kids’ rooms and bathrooms, so you won’t have constantly reminded them to turn off the light. 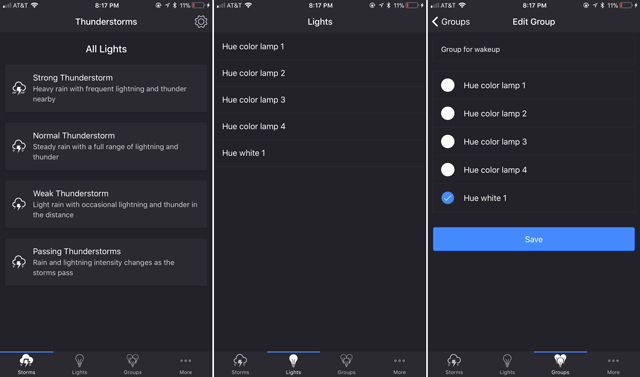 Whether it’s to create the mood for a spooky story or you’re one the many who like sleeping during thunderstorms, your Hue lights can create a credible storm with Thunderstorm for Hue ($2.99 for iOS and Android). The app boasts four different storm strength settings—Passing Thunderstorms, Weak Thunderstorm, Normal Thunderstorm and Strong Thunderstorm—and there are even realistic sound effects that can be played through your smart speaker to make the experience even more immersive. Want would-be thieves to think you’re at home? You can set your lights to automatically mimic your presence. 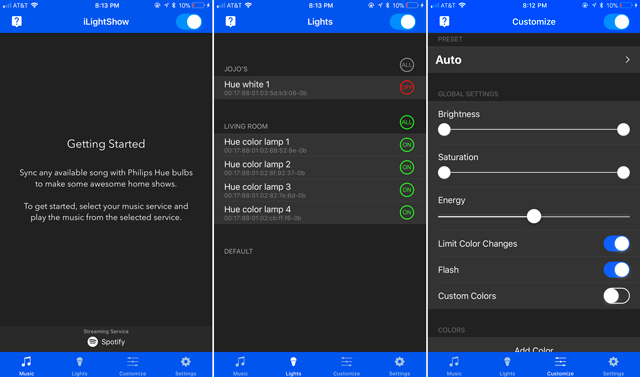 All you need to do is open your Hue app, go to Routines > Other Routines, then schedule specific rooms to turn on and off at “random” times or roughly following your routine during the night. Obviously, it doesn’t replace proper smart home security. However, it does help keep would-be intruders at bay. You can set up your Hue lights to know when you’re close to home so you will never have to come home to a dark house. Using your phone’s location information, the Hue app can tell when you’re close to home and turn on the lights. To set it up, you just need to go to Routines on the Hue app, select Home & Away and activate the Coming home feature. Want to have your favorite music playing or your home at the perfect temperature when you arrive? Lighting is just the beginning of getting started with your smart home. 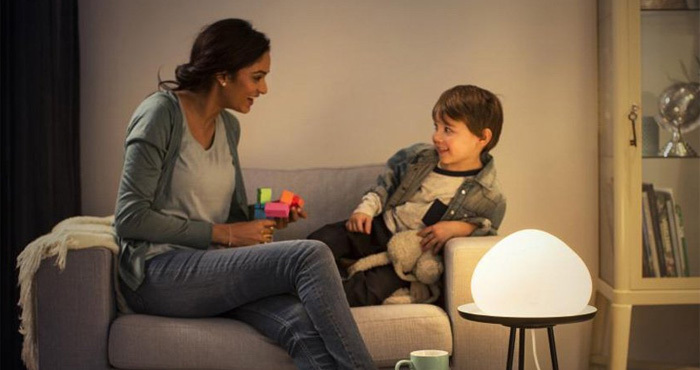 Philips has a wide range of smart lighting products. You can get started for just $70 with a 2-bulb white bulb starter kit (Amazon) or spring for a 4-bulb White and Ambiance starter kit for $175 (Amazon). Both starter kits include a Hue Bridge to connect to Alexa, Apple HomeKit and Google Assistant. Once you have a starter kit, there are a variety of bulbs to choose from, including strip lights ($85 on Amazon), which are great for kitchens, cabinets and hallways, specialty bulbs for use in chandeliers and nightlights (starting at $30 on Amazon) and floodlights ($50 on Amazon). There are also Smart Lamps (starting at $60 on Amazon), flush-mount ceiling lights (starting at $195 on Amazon) and, soon, outdoor lights. Thank you for posting this article. It was very informative.